Below is a story that ran in the Chicago Tribune last week. Some idiot took a pot shot at a immature bald eagle, supposedly mistaking it for a Red Tailed Hawk (immature bald eagles are brown as pictured to the left). That is the actual photo of the eagle which is expected to recover. Hopefully, someone will rat on this person and turn them in for doing something so stupid. He could face a stiff fine and jail time as mentioned below. 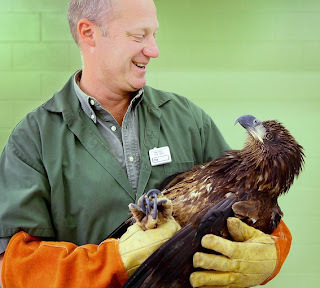 Remember, from a previous posting on this blog (check it for details), the bald eagle release on November 12th at Starved Rock Park will be held as scheduled. Please try to come out and support the effort. A juvenile bald eagle found shot in the wing along the Illinois River west of Starved Rock State Park may have been shot by a bored duck hunter who decided to take a "pot shot" at it, according to one theory posed by conservation police. Investigators are hoping a $1,000 reward may lead to an arrest. "Why anyone would shoot at an eagle is beyond me," said Illinois conservation police Sgt. Hank Frazier, adding that his department has no suspects. "They're very big birds. There'd be no way you can mistake that." Shooting an eagle is a federal crime punishable with up to a year in jail and a $100,000 fine. The bird, which has undergone surgery, is expected to recover. "He's doing very well," Robert Harms, a veterinarian at Countryside Animal Clinic in nearby Streator, said Wednesday. "He's bright, strong, alert. Starting to be a little more aggressive today, which is good." A barge captain spotted the eagle struggling to fly along the river near Hennepin on Sunday. Conservation police recovered the bird and brought it to the clinic. Harms said shotgun pellets had fractured the ulna, a long bone in the wing, and that he'd inserted a pin in the bone. The eagle will be transferred to the Hoo Haven Wildlife Rehabilitation and Education Center in Durand, northwest of Rockford, possibly on Thursday. The Illinois Department of Natural Resources asks anyone with information on the shooting to call its poacher hotline at 877-236-7529. These frameworks can be extremely useful for sorting out your pharmaceutical on the off chance that you need to take a variety of medications which all run out at various circumstances of the month. Online medical stores https://canadianviagras.net/pill/viagra-canada/ are additionally an incredible method to maintain a strategic distance from humiliation. "You Doctor....You Fix." A Strange Experience.